I read this blog daily. If you're a fan of Lost, you might want to read it, too. Jorge has been posting an Advent Calendar consisting of photos of his dog chewing various things around the house. Today's post mentions how Nunu likes to chew (eat) cat poop. Well, I have a dog that does this too, so I posted a reply to Jorge's post. 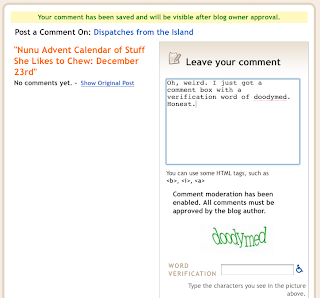 His comments are moderated, and you have to do a word verification before your comment can be submitted. I submitted my comment with no problem. Then the blank comment "form" came back up, as it does, and displayed a new verification word. Here's a screen shot. What do you think? Weird, huh?! !